Three troubled teen thieves pose as the wait staff at an upscale dinner party for a certain group of addicts in order to break in to a hidden safe and take advantage of the very well-off guests. The party takes a very wild turn when it's revealed that each of the party guests is a serial killer trying to maintain their sobriety. 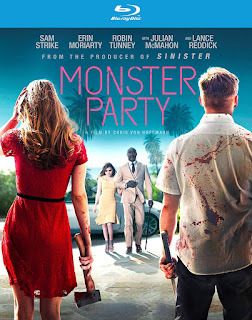 MONSTER PARTY caught me off guard in almost every aspect of the film. The trio of teens are excellent and have a natural chemistry together that makes you believe they could be a fairly well oiled burglary machine and they're actually quite likable together despite being involved in an unsavory profession. Add in a supporting cast that includes Lance Reddick and Robin Tunney and you have a really well acted film. Chris Von Hoffman doesn't waste the talent he has on screen with boring, stagnant direction, as he adds bits of flair and little flourishes that elevate the movie above similar movies that are helmed by less capable directors. 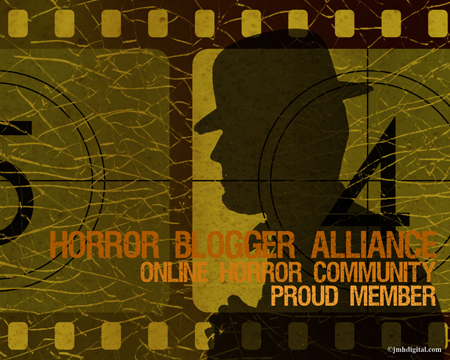 MONSTER PARTY is fast paced and becomes increasingly bloody and gory as the movie progresses. The idea of recovering serial killers is not only an interesting one but is well thought out and is more than just an excuse for the killing in this horror movie. It sets up another level and a dynamic between the relationship of certain secondary characters that elevates the third act beyond being all about the splatter and scares. The 2.35:1 anamorphic widescreen transfer has a great look with strong detail and a natural and healthy presentation to skin tones. During the more colorful moments of the film the palette is vibrant and strong without looking too hot or colors bleeding into one another. The 5.1 DTS-HD Master Audio mix is strong and powerful while still maintaining a well done mix between the soundtrack and dialogue. Sadly the disc is bare bones. I would have loved to have seen some special features on this especially given some of the big names included in the cast but the movie alone is enough to recommend this release.